Sound reduction is important when attempting to stop noise from exiting a room when playing loud music, or from entering the room when you're trying to sleep. It's important to stop sound from bouncing back if you're making home recordings. The level of soundproofing depends on what you use to accomplish it. Egg crates won't soundproof a room. Sound deadening -- reduction of echo -- is a more appropriate use for egg crates. Genuine sound-proofing is nearly impossible. Recording studios rely on sound isolation for certain rooms, it's difficult -- if not impossible -- to achieve without extensive preparation, materials and expense. True sound isolation is accomplished by acoustical engineers, by isolating rooms with dampening layers, air spaces, isolating joists and other structural members with spring-loaded joist hangers, among other preparations. Egg crates do not absorb, diffuse or deaden sound to any extent, except for a vary narrow frequency range. The reduction of the narrow band is insignificant for home acoustic coefficients. Sound diffusing is the process of scattering the sound waves around the room. The myth that egg crates are effective at soundproofing has been around for many years. It originates from its resemblance to acoustical foam, a product that sports the familiar raised domes that resemble egg crates. Acoustical foam is an engineered, sound-reducing product with specific dome and valley shapes to diffuse sound. Egg crates are cardboard and their shapes are designed to cradle eggs. However, cardboard or paper egg crates do have acoustical value, as they can reduce echos, sound reflection and resonance at certain frequencies. Egg crates, when lab tested for noise reduction, score 0.4 on the NRC, or noise reduction coefficient, scale This means that 40 percent of the sound waves are absorbed by the material, with 60 percent exiting or entering the room, or reflecting back in your face. For the sake of comparison, two and one-half-inch-thick acoustic egg crate foam rates .60 on the NRC scale. 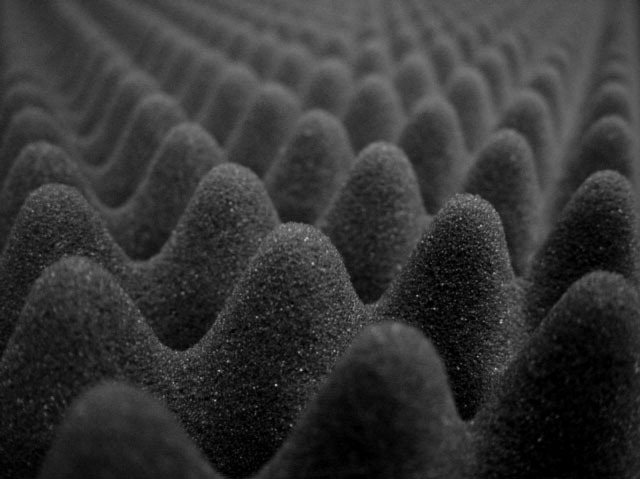 Don't confuse acoustical foam with mattress pad foam, which may also have the egg-shaped domes. Acoustical foam, 1 1/2-inches thick with an NRC rating of .45, distances itself from 2-inch-thick polyester mattress pad foam, which rates only about .6 on the NRC scale. Apart from the flammability issue with egg crates, there's no reason why you can't use them for acoustic improvement to reduce echoing and sound reverberation. It's a simple process of cutting and stapling. Open the egg carton. Use scissors to trim off the lid and flap, leaving a 1/2-inch lip on both. Place the egg crate against the wall in a corner, starting at the bottom of the wall, with the dome-shapes facing out. It doesn't matter if the cartons are vertical or horizontal, but horizontal positioning makes it easier to stack them. Staple the carton to the wall, shooting staples through the lips on both sides. Use staples with at least a 3/8-inch leg, and 1/2 of a crown. Continue to place egg cartons, overlapping the lips, and stapling. Repeat on the ceiling if needed. If you're serious about reducing the sound that enters and exits a room, skip the egg crates. There's a variety of affordable alternatives that work better than egg crates. Standard drywall is rated at .20 on the NRC scale. Two layers of drywall bring the NRC rating up to .40. Replace hollow doors with MDF, or medium-density-fibercore doors, which have an NRC rating of .27. Soundproof curtains are portable and rate as high as egg crate foam, but can be removed if needed. Thick carpet with padding reaches about .35 on the NRC scale. Use throw rugs on the floor, or hang carpet remnants on the wall. How Does Sound Proofing Work?